Finished In Grigio Lynx Metallic Paint With Nero Ade and Rosso Alala Upholstery. Full Service History Completed By Lamborghini Manchester. 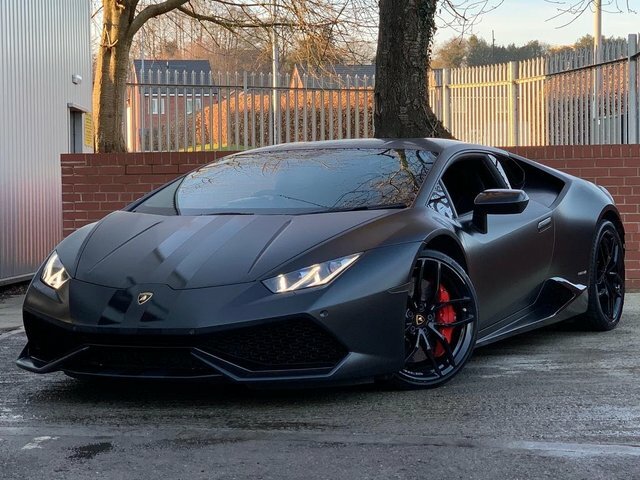 Quite Possibly The Highest Spec'd Huracan On The UK Market Today With Over £40K Worth Of Optional Equipment Which Include: 20' Forged Mimas Alloys In Gloss Black, Red Brake Calipers, Transparent Engine Bonnet, Style Package, Lamborghini Graphics Kit, Electric and Heated Seats, Kick Plate In Forged Composites, Alcantara Headlining, Lifting System, Auto Dimming and Folding Mirrors, 5 Years Warranty, PPF Film Protection, Navigation and Smartphone Interface, Front and Rear Parking Sensors and Reverse Camera, Lamborghini Dynamic Steering, Race Exhaust System and Magneto-Rheologic Suspension. Can Only Be Described As 'New' Throughout With A Complete Set Of User Manuals, Floor Mats, Two Keys, Car Cover and Service History. Please Call or Email To Discuss., 1 owner, 2 seats, FREE NATIONWIDE DELIVERY - 5.4% APR FINANCE AVAILABLE - 12 MONTHS WARRANTY!!! Metallic Onyx Black, Finished In Onyx Black Metallic Paint With Full Black Leather Upholstery. An Exemplary Vehicle With No Expense Spared And A List Price In Excess Of £200k. Spec Includes: Mulliner Driving Specification, Panoramic Sunroof, 22' 5 spoke Gloss Black Alloy Wheels, Carbon Fibre Exterior Body Styling Kit, Gloss Black De-Chroming To Exterior Brightware, Adaptive Cruise Control, Naim For Bentley Premium Audio System, Night Vision, Bentley Safeguard Plus, Digital TV Tuner and Digital Radio, Body Coloured Lower Bodywork, Privacy Glass, 3 Spoke Single Tone Hide Trimmed Heated Steering Wheel, Comfort Rear Outer Headrests, Deep Pile Overmats To Front and Rear, Veneered Picnic Tables, Traffic Assist, Valet Parking Key, Embroidered Bentley Emblems To Vehicle Seatfaces, Drive Dynamics Mode, Hands Free Power Tailgate, Remote Control Garage Door Opener, Ventilated Front Seats With Massage Function, Top View Camera, Head-Up Display, Lane Assist, Park Assist, Pedestrian Warning System, Traffic Sign Recognition System, Reversing Traffic Warning, Electrically Operated Blinds For Rear Side Windows and Navtrak ADR. This Is A Very Special and Unique Example of The Iconic Bentayga. Built Simply To Showcase The Bentayga With Every Conceivable Optional Extra. To Say This Vehicle Is In Showroom Condition Is An Understatement. Please Call or Email To Discuss., Last serviced on 29/03/2019 at 7,100 miles, Full dealership history, New bodywork, Interior - New Condition, Tyre condition New, 5 seats, FREE NATIONWIDE DELIVERY - 5.4% APR FINANCE AVAILABLE - 12 MONTHS WARRANTY!!! Finished In Special Order Paint With Full Black Leather Upholstery. This Is A Bentley Factory Show Car and Quite Possibly The Highest Spec'd Bentayga To Roll Off The Production Line. Spec Includes: Mulliner Driving Specification, Panoramic Sunroof, 22' 5 spoke Matt Black Alloy Wheels, Carbon Fibre Exterior Body Styling Kit, Gloss Black De-Chroming To Exterior Brightware, Adaptive Cruise Control, Naim For Bentley Premium Audio System, Night Vision, Bentley Safeguard Plus, Digital TV Tuner and Digital Radio, Rear Seat Entertainment, Body Coloured Lower Bodywork, Privacy Glass, 3 Spoke Single Tone Hide Trimmed Heated Steering Wheel, Comfort Rear Outer Headrests, Deep Pile Overmats To Front and Rear, Veneered Picnic Tables, Traffic Assist, Valet Parking Key, Embroidered Bentley Emblems To Vehicle Seatfaces, Drive Dynamics Mode, Hands Free Power Tailgate, Remote Control Garage Door Opener, Ventilated Front Seats With Massage Function, Top View Camera, Head-Up Display, Lane Assist, Park Assist, Pedestrian Warning System, Traffic Sign Recognition System, Reversing Traffic Warning, Electrically Operated Blinds For Rear Side Windows and Navtrak ADR. 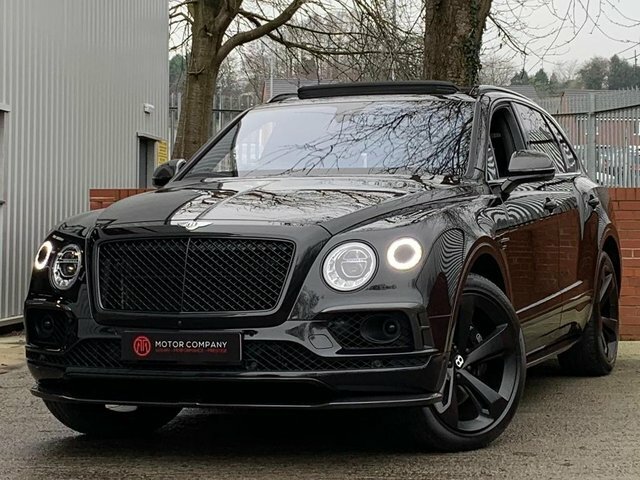 This Is A Very Special and Unique Example of The Iconic Bentayga. Built Simply To Showcase The Bentayga With Every Conceivable Optional Extra. To Say This Vehicle Is In Showroom Condition Is An Understatement. Please Call or Email To Discuss., 1 owner, 5 seats, FREE NATIONWIDE DELIVERY - 5.4% APR FINANCE AVAILABLE - 12 MONTHS WARRANTY!!! Finished In Midnight Sapphire Paint With 3M Satin Black Wrap Through The Centre Of The Vehicle and Creme Light Upholstery. 3 Owners and Only 16,000 Miles With Full and Comprehensive Rolls Royce Service History and Rolls Royce Service Plan. Remainder Of Manufactures Warranty. 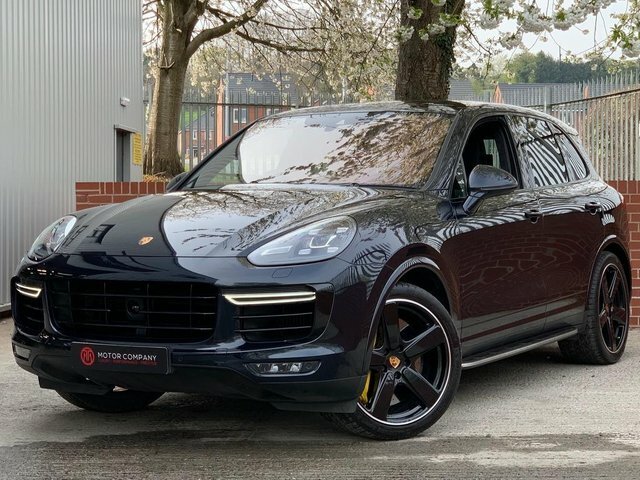 A Very Desirable Specification With Options Including: 20' Seven Spoke Alloys Finished In Satin Black, Navigation System, Soft Close Doors, Walnut Burr Inlays, Cornsilk Carpets and Mats, Media System and Front and Rear Parking Sensors. 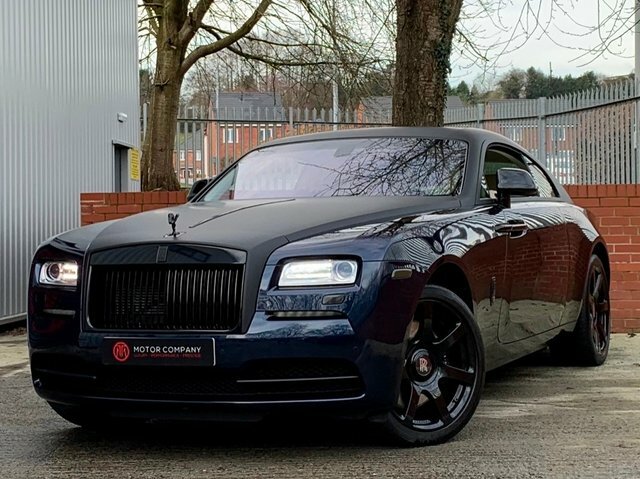 This Iconic Wraith Is Flawless Throughout With An Unblemished History. Please Call or Email To Discuss., 3 owners, 4 seats, FREE NATIONWIDE DELIVERY - 5.4% APR FINANCE AVAILABLE - 12 MONTHS WARRANTY!!! 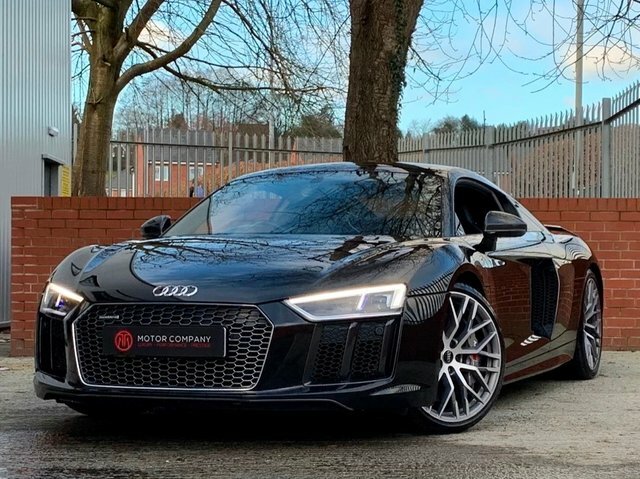 SPORTS EXHAUST PIPES - MAGNERIDE DUAL MODE SUSPENSION - BACKBONE STYLE SEATS - CARBON DRIVER ZONE - CARBON CENTRE BRID - SCUDERIA SHIELDS Finished In Metallic Rosso Corsa Paint With Full Beige Tradizone Leather Upholstery And Nero Black Carpets. An Exemplary Ferrari California T With Arguably The Most Desirable Specification Available On Todays Market. No Maintenance Expense Has Been Spared With A Full HR Owen Service History And Complete With An Extended Manufacturers Warranty Until 31/10/2019 Cost Circa £3,000. The Extensive List Of Optional Extras Include: 20' Forged Spoke Alloy Wheels Painted Black, Ferrari Sports Exhaust Pipes, Magneride Dual Ride Suspension, Carbon Fibre Driver Zone, Carbon Fibre Centre Brid, Chromed Front Grill, Yellow Brake Callipers, Backbone Style Front And Rear Seats, Full Electric Seats, SCUDERIA Ferrari Shields, Horse Stitched On Headrest In Rosso, Red Coloured Safety Belts, Yellow Rev Counter, Front End PPF, Nav Trak System. A Un Blemished Example With An Outstanding Specification Complete With Official Indoor Car Cover. Please Contact Us For More Information., 3 owners, 4 seats, FREE NATIONWIDE DELIVERY - 5.4% APR FINANCE AVAILABLE - 12 MONTHS WARRANTY!!! Finished In Obsidian Black Metallic Paint With Full Black Nappa Leather Upholstery. This Ex-Demo Has Only Delivery Miles and Is Presented In Non Other Than Showroom Condition. 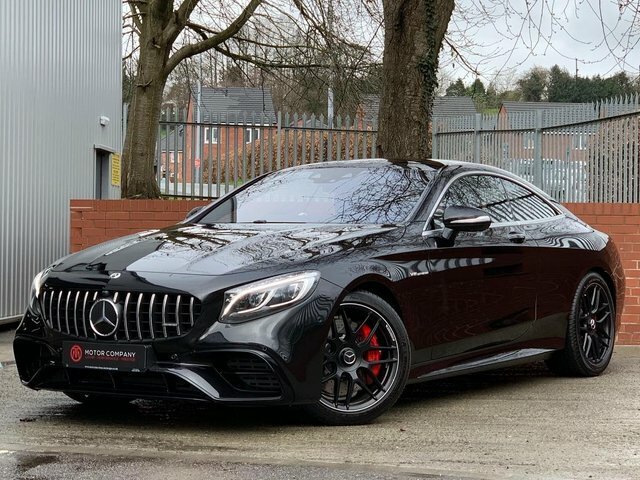 An Excellent Specification Which Includes: 20' AMG Cross-Spoke Forged Wheels Painted Matt Driving Assistance Package, Keyless-Go Package, Air-Balance Package, Parking Package with 360-Degree Camera, AMG Night Package, Black Poplar Wood Inlays, Red Brake Calipers and Panoramic Sunroof. Please Call or Email To Discuss., Upgrades - AMG Drivers Package, AMG Night Package, AMG Perf.3-Sp.Multi.Steer.Wheel Nappa Lth./Dina., Air-Balance Package, Alloy Wheel - 20in AMG Cross-Spoke Forged Matt B., Brake Calipers Painted in Red w. AMG Lettering, Car Telephony, Trim - Designo Black Piano Lacquer, 1 owner, Standard Features - Active Parking Assist with Parktronic, Alarm System with Interior Protection, Bluetooth Interface with High Definition Call Quality, Burmester Surround Sound System 590W, COMAND Online System, Hard Disk Drive Navigation with 3D Map Display, European Map Data Updates, Comfort-Ventilated Front Seats - Heating/Cooling with AIRSCARF Neck-Level Heating System, DAB Digital Radio Tuner, Door Mirrors - Electrically Adjustable, Folding, Heated and Automatically Dimming Drivers Exterior Mirror with Memory, ECO Start/Stop Function, Front Seats Electrically Adjustable with Memory and Massage Function, Heat-Insulating, Noise-Insulating and Infrared-Reflecting Laminated Glass, Hill Start Assist, Keyless-Go/Remote Boot Closing/Hands Free Access, Linguatronic Voice Control, Metallic Paint, Nappa Leather Upholstery, Panoramic Roof with Electric Sun Blind, Power Windows with One Touch Control and Obstruction Sensor, Radio, Single CD/DVD Drive with MP3 Compatibility, SD Memory Card Slot, 10GB Music Register, Media Interface, Integrated WLAN Hotspot, Tyre Pressure Monitoring System. 4 seats, FREE NATIONWIDE DELIVERY - 5.4% APR FINANCE AVAILABLE - 12 MONTHS WARRANTY!!! LED LASER HEADLIGHTS - FULL CARBON PACKAGE - MAG RIDE - SPORTS EXHAUST - B&O SOUND!!! Finished In Mythos Black Metallic Paint With Full Black Recaro Bucket Seats. 2 Owner With Full Audi Service History. Quite Possibly The Highest Spec'd R8 V10 Plus On The UK Market With A List Price Of £160k. Equipped With £20K Worth Of Optional Equipment Which Includes: Sideblades In Gloss Carbon, 20â€ ""10-Spoke Y' Design Forged Alloy Wheels, LED Headlights With Audi Laser Light and High-Beam Assist, Dynamic Steering, Audi Magnetic Ride, Sport Exhaust System, Bang & Olufsen Sound System, Extended Fine Nappa Leather Pack, Rear-View Camera, Exclusive Carbon Package, Exterior Mirror Housings In Gloss Carbon, Large Fixed Rear Spoiler In Gloss Carbon, V10 Plus Gloss Carbon Styling, Alcantara Headlining, Matt Carbon Inlays, Advanced Key, Audi Smartphone Interface and Ceramic Brakes. An Incredible Example Throughout With The Perfect Spec and Perfect History. Please Call or Email To Discuss., 2 owners, 2 seats, FREE NATIONWIDE DELIVERY - 5.4% APR FINANCE AVAILABLE - 12 MONTHS WARRANTY!!! CARBON CERAMIC BRAKES - AMG DRIVERS PACK - AMG PERFORMANCE EXHAUST - HEADS UP DISPLAY!!!! Finished In Designo Magno Night Black With Full Black AMG Performance Seats. The Highest Spec'd E63's Edition 1 In The UK With A List Price Of 125K. Optional Equipment Includes: AMG High Performance Ceramic Composite Brakes, Edition 1 Package, 20' AMG Cross-Spoke Forged Alloy Wheels Painted in Carbon Fibre Interior Trim, Head Up Display, AMG Driver's Package (Raises Electronically Limited Top Speed to 186mph), AMG Performance Selectable Exhaust System, AMG Dynamic Select, AMG Electronic Rear-Axle Limited-Slip Differentials, AMG Performance Exhaust System, AMG Ride Control, Active Dynamic Engine Mounts, 3-Spoke AMG Performance Multifunction Steering Wheel, Mirror Package, 360 Degree Camera, Heated & Electronically Adjustable Door Mirrors, Panoramic Electric Glass Sunroof, Privacy Glass, Two-Zone Automatic Climate Control, Illuminated AMG Door Sills, Burmester Surround Sound System, COMAND Online, DAB Radio, Android Auto, Apple CarPlay. A Very Unique Example and In Showroom Condition. Please Call or Email To Discuss., 2 owners, 5 seats, FREE NATIONWIDE DELIVERY - 5.4% APR FINANCE AVAILABLE - 12 MONTHS WARRANTY!!! FACELIFT - MULLINER SPEC - FULL BENTLEY HISTORY!!! Finished In Onyx Black Metallic Paint With Ebony and Beluga Diamond Quilted Upholstery. Full and Comprehensive Bentley Service History With Only 24,000 Miles. An Exceptional Example With The Perfect Specification Which Includes: Premium Carpets With Contrast Stitching, Mulliner Driving Specification, Dark Tint Front and Rear Lamps, Heated Steering Wheel, Neck Warmer Piano Black Inlays, Heated and Ventilated Front Seats With Massage Function, Wind Deflector, Digital TV Tuner, Rear View Camera, Sports Exhaust and 21' Seven Spoke Alloy Wheels - Black Limited Edition. Standard Equipment Includes: HDD Navigation, Park Distance Control, Multi - Zone Automatic Climate Control System, Digital DAB Radio, Electronic Cruise Control, Keyless Ignition, Bentley GPS Tracking System Provision, Electronic Tyre Pressure Monitoring System (TPMS), Rain Sensing Windscreen Wipers, Telephone Control with Bluetooth. The Condition Can Only Be Described 'As New' Throughout With A Flawless History and The Perfect Specification. 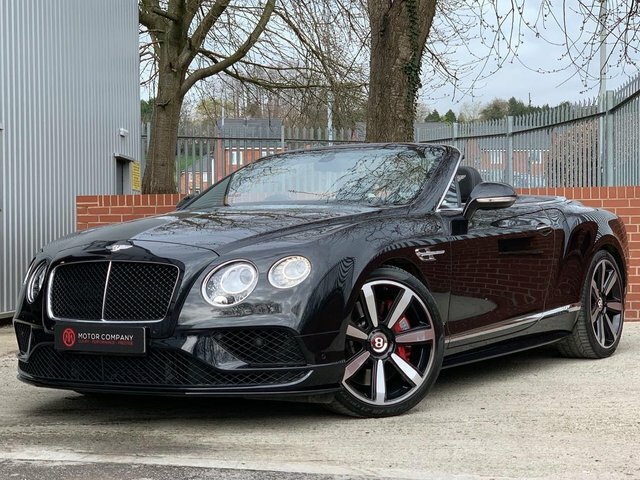 Please Call or Email To Discuss., 2 owners, 20in x 9.5J 5 - Spoke Alloy Wheels in Painted Finish with Black Wheel Centre Badges 275/40ZR 20 Tyres, 8in High Resolution Touch Screen, AM/FM Radio, Single DVD/CD/MP3 Slot, Bentley GPS Tracking System Provision, Digital DAB Radio, Drivers and Front Passenger Seats - 14 - Way Adjustment Including Memory, Electronic Cruise Control, Electronic Tyre Pressure Monitoring System (TPMS), HDD Navigation, Heated Front Seats, Keyless Ignition, Multi - Zone Automatic Climate Control System, Park Distance Control with Graphic on Infotainment Screen and Audible Warning, Rain Sensing Windscreen Wipers, Telephone Control with Bluetooth, Upholstery - Leather, Voice Activation, Volumetric Ultrasonic Alarm. 4 seats, FREE NATIONWIDE DELIVERY - 5.4% APR FINANCE AVAILABLE - 12 MONTHS WARRANTY!!! Get the best deal on a used car for sale in Congleton by making your way to TMT Website Account today. You will find every available model listed here on the website, and as all our stock is competitively priced you should have no problem sourcing a pre-owned to suit your budget. Take the opportunity to browse our current range online before contacting a member of the showroom team to find out more. Our friendly and knowledgeable staff will be more than happy to answer any questions and provide advice and guidance when necessary. Alternatively, why not pay a visit to our showroom in person and take a closer look at the selection of used car models for sale.